The scribes and the chief priests sought to lay hands on Him at that very hour, for they perceived that He had told this parable against them, but they feared the people. So they watched Him and sent spies, who pretended to be sincere, that they might catch Him in something He said, so as to deliver Him up to the authority and jurisdiction of the governor. As it turned out this was not some random day it all happened on a Thursday, and not just any Thursday in any old week. No it had been a dramatic week already. On Sunday Jesus had ridden into town on the back of a donkey to the sounds of loud Hosannas, crowds waving Palm Branches, but He didn’t head straight to Pilates Governors’ Palace to overturn the Roman Authorities, no He’d went straight to the Temple and tossed out the money changers. That Sunday Jesus rocked the boat so very hard and He did it just as everyone was preparing for the big Passover celebrations. Then each day He’d gone up to the Temple to teach and each day the Scribes and the Pharisees and the Lawyers and Levitical Priests and the Herodians were there. They were all there along with “the sinners” and the tax collector and the Jews who’d traveled a long way to come for Passover celebrations, it was a big melting pot of the rich and the poor, the powerful and the week, the strong and the silent, the listeners and the big talkers. Every eye was on Jesus and while the powers that be might not have minded too too much when Jesus’ star was burning bright out in Galilee, they weren’t all too crazy about Jesus gathering the crowds around Him within the walls of the Temple, within the walls of Jerusalem the Holy City: and they were even less crazy about how pointed this Jesus was in His Parables. Like I said they suspected that Jesus was pointing at them ... and truth be told He was. The Jewish leaders were hoping that this Jesus’ star would be a falling star, a shooting star, and that His light would fade away, fizzle out and vanish and when that didn’t happen they became truly concerned and they weren’t opposed to the idea of speeding up the process of Jesus’ fall from public grace and fame. In fact Luke’s Gospel tells us that in the days leading up to that particular Thursday, the day when Jesus told the parable of the wicked tenants, “The chief priests and the scribes and the principal men of the people were seeking to destroy [Jesus], but they did not find anything they could do, for all the people were hanging on His [every word].” The thought of doing something about this Jesus was on their minds as they listened to His parables in the Temple that first Holy Week. 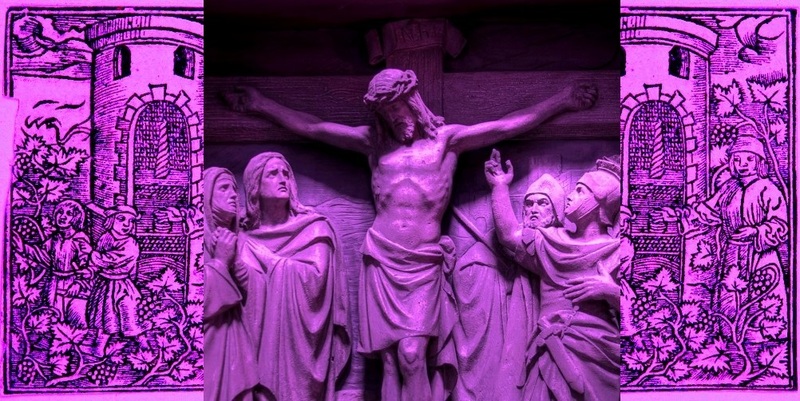 One more thing about this particular Thursday in Holy Week; remember this Thursday as it turns out was actually was no regular Thursday, at least it’s not counted as a regular Thursday when we look back on it; you see while His disciples didn’t know what was coming next Jesus did. That night was the night in which Jesus was to be betrayed, and on that night Jesus would first sit with them in that upper room and break bread and say “take and eat, this is my Body,” That very night after the meal He would take up the cup and say “take and drink, this is my blood of the covenant shed for you for the forgiveness of sin.” Within 24 hours Jesus would be betrayed by His disciple Judas and all of them would abandon Him and as Friday unfolded He would be lead off to trial and to death by crucifixion. On the Thursday when Jesus told this parable about the Wicked Tenants Jesus knew what was coming; the crowds, Jewish Authorities, the disciples did not. The parables of Jesus regularly have a moment in them where the first hearers would say, “No Way, Jesus!” Jesus usually puts in some detail that when heard the listen would say “No Way!” “That’s not how the World works!” For example when Jesus asks the Scribes and the Pharisees, “What man of you, having a hundred sheep, if he has lost one of them, does not leave the ninety-nine in the open country, and go after the one that is lost, until he finds it?,” the answer is no man would, they’d cut their losses and be happy with the 99 sheep they still have. And they certainly wouldn’t throw and party for friends and family worth more than the market value of the sheep saying, ‘Rejoice with me, for I have found my sheep that was lost,’ even if they did happen to find it. Jesus of course is drawing a stark distinction between how man works with how God works. Today’s’ parable by Jesus is no different. There are a couple of “No Way [! ]” moment in this parable. 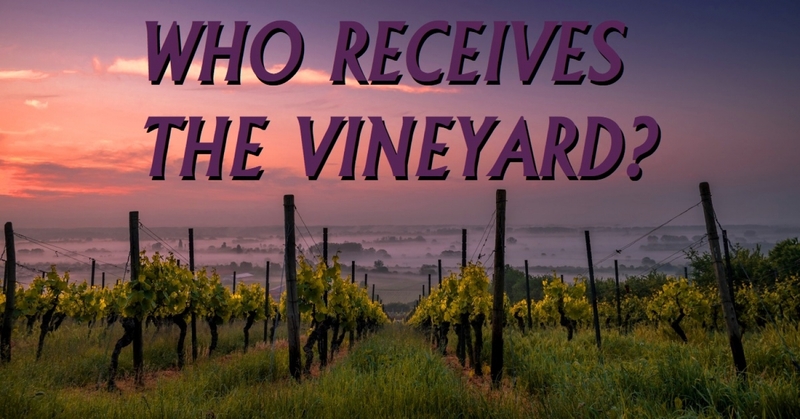 One of these moments is when Jesus says that, the wicked tenants, seeing the Son of the Owner coming to collect the fruit of the vineyard, say to each other ‘This is the heir. Let us kill him, so that the inheritance may be ours.’ What man, after experiencing the tragic loss of his beloved son by the hands of murders, would then turn around and change his last will and testament so that the inheritance would go to the ones who plotted and savagely murdered his son? No man would, no one would change their will in this way. This is what makes the words of the wicked tenants in the parable laughable, this plan of theirs is just so flawed, so dim-witted that it’s impossible to believe: but then there’s this peculiar thing that happens. If you read this parable in the context of that Thursday, in the context of the crucifixion and in the context of Salvation History, then the son of the vineyard owner is most certainly Christ Jesus, and the owner of the vineyard is God the Father, the wicked tenants are not just the Scribes and the Pharisees and the other religious leaders of the day but the wicked tenants are the whole of the children of Israel, and by extension the wicked tenants are all the sinful people of the world, from the beginning of time to the end of time; these are the wicked tenants who selfishly want to hold onto what isn’t theirs; these are the wicked tenants who wish to kill God and everyone God sends to them (even His own Beloved Son), these wicked tenant are everyone. Which means that, on the one hand, while this parable is about selfishness, greed and coveting: Selfishness in the face of Authority, Greed in the face of God’s good gifts and Coveting in the face of the gifts given to others? The wicked tenants want everything to themselves to have complete control over it, just as we do in our darkest moments. 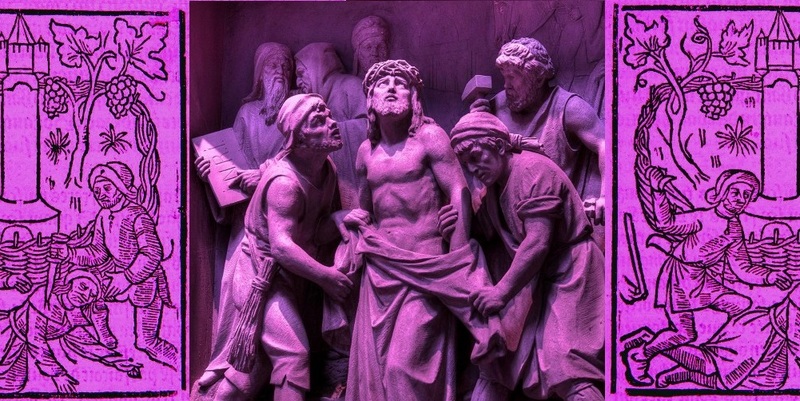 With each of these sins, with each of our sins, whatever they may be, we drag Jesus out of the vineyard and we kill Him, we nail Him to the cross just as surely as the Roman Soldiers did. While on the other hand, this parable is also a prophetic parable about what will happen to Jesus. When it comes to Jesus’ death St Peter, one of Jesus twelve disciples, makes no distinction between one group or another when fifty days following Jesus’ resurrection from the dead, on the Day of Pentecost Peter says to the crowd: “Men of Israel, hear these words: Jesus of Nazareth, a man attested to you by God with mighty works and wonders and signs that God did through Him in your midst, as you yourselves know—this Jesus, delivered up according to the definite plan and foreknowledge of God, you crucified and killed by the hands of lawless men.” Everyone is included: He doesn’t even single himself out in this. For he along with all the disciples ran away as Jesus was arrested in the garden. He personally was guilty of denying Jesus as the rooster crowed, denying that he even knew who Jesus was while Jesus was being falsely accused, beaten and crucified. The blood of Jesus was on Peter’s hands too, just as Jesus’ blood was on everyone’s hands. We also see in 1 John that “[Jesus] is the [atoning sacrifice] for our sins, and not for ours only but also for the sins of the whole world.” Not some sins, all sins, even the sin of murder, even the sin of murdering the beloved Son of God. Jesus forgives the blood on Peter’s hands; Jesus forgives the blood on yours. In fact it is His blood on your hands, made to be a cleansing flood in your baptism into Jesus, which in a twist of fate brings you your forgiveness. In fact His death was for all, His death was for the atonement of all the wicked tenants: “For God so loved the world, that He gave His only Son,” not for God so loved some People in the world, not for God so loved a select group people in the world, not a handful, but rather God loved the world. His death is for everyone, the death of the Father’s Son paved the way for adoption into the Father’s House for the very ones who should have no place there. Jesus’ death made sons and daughters out of God’s enemies. His death extended His personal inheritance, as God’s beloved Son, to you. St Paul tells us that, “while we were enemies,” while we were still those wicked tenants from Jesus’ parable, “while we were enemies we were reconciled to God by the death of His Son, much more, now that we are reconciled, shall we be saved by [Jesus’] life.” This “No Way[! ]” moment in Jesus’ parable has come to pass at the cross, at the empty tomb, in this we see that God’s ways are not man’s ways. Christ that would leave the ninety-nine to save the one, Christ who would walk alone into the jaws of death for you is not like other people, God is not like us, and we as Christian seek to be like Him. Again His blood on our hands, transformed in our baptism into Him, makes us heirs of the vineyard. This is an unexpected outcome of the crucifixion. And it is what had to happen to bring us to God. This leads us back to that question Jesus asked concerning Psalm 118: “What then is this that is written: “‘the stone that the builders rejected has become the cornerstone’? Everyone who falls on that stone will be broken to pieces, and when it falls on anyone, it will crush him.” Here Jesus is speaking of Himself, and the danger of rejecting Him. 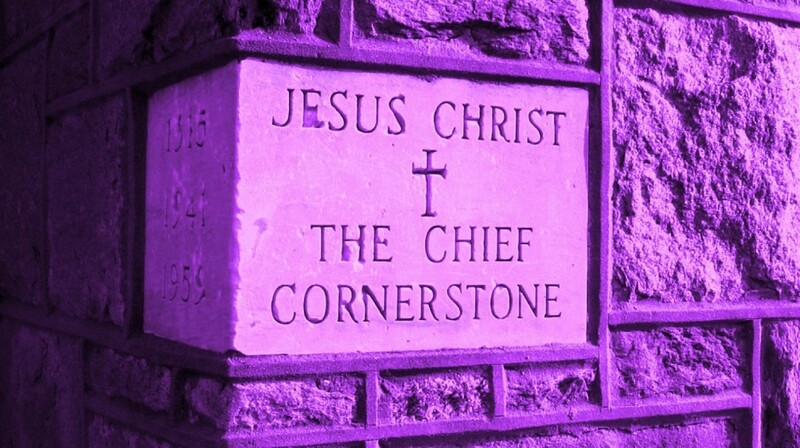 This fits so well into the words of Simeon “Behold, this child is appointed for the fall and rising of many in Israel, and for a sign that is opposed” Jesus is the cornerstone of Christian Faith, He is the Rock upon which we stand, there is no other: If you stand on Peter “the rock” remember that he crumbled under pressure and denied Jesus, if you stand on your pastor, or the people of your church, or yourself you may (and will) be equally disappointed, “for all have sinned and fall short of the glory of God,” you have no one to stand on apart from Jesus. You therefore are called to be a faithful tenant yet it is easy for us all to be wicked tenants. How does Jesus put it? He says, “Enter by the narrow gate. For the gate is wide and the way is easy that leads to destruction, and those who enter by it are many.” This is the way of the wicked tenant, and then Jesus says, “For the gate is narrow and the way is hard that leads to life, and those who find it are few.” This is the way of the faithful tenant. Jesus took the narrow way threading you through the eye of the needled of His crucifixion so that you would have eternal life in Him. Be therefore good stewards of what has been entrusted to you. Jesus’ bride the Church and the Sacraments are like the vineyard in the parable. You are to be good stewards of these gifts, to pass down what has been given to you, to pass that down again to others, to avoid innovations and conceits and worldly ways in keeping with the spirit of the day; for there are many false teachings and doctrines which lead to destruction. Be on guard, remain faithful, be faithful, hold steadfast to your confession of Faith in Christ Jesus and do not let it be taken from you. What is God’s desire for the wicked tenants who have rejected Christ outright, for those tenants who hate Him and want Him dead, and gone, and buried forever, for those tenants who want Him to be forgotten, for the wicked tenants who desire no forgiveness from the owner of the vineyard? For the tenants who want to have the vineyard for themselves without the Owner or His Son over them? The desire is for them to repent. Therefore there is hope for them, hope for you and for me: Remember amongst the ones counted as a Pharisee on the day that Jesus told this parable (whether he was present in the crowd or not) was a young Pharisee named Saul, he was changed by God and brought to faith in Jesus and we know him as St. Paul, and we have heard from him today. God desires all people to return to Him and to have their hope and faith and trust in His Son Jesus. For You Jesus is your cornerstone, the Rock of your salvation, the One upon who you stand, the One who will never fail you, the One who’s blood, and death has strangely enough set you free, and made you a son, made you a daughter of God your Heavenly Father, the vineyard is now your inheritance and you are free to live in it without Murder, or Selfishness, or Greed, or Coveting, these sins are forgiven and on The Last Day there will be no more sin, not even one. All wickedness will be gone forever. Therefore today when you, in your sin, are confronted in your sin and you desire Jesus to be gone, desire His Word to be murdered, thrown out of the city: Stop, repent and turn to God, return to Him in faith for you are now His son, His daughter, His child. Amen. Lord have mercy on us, Christ have mercy, Lord Have Mercy, “take our minds and think through them, take our lips and speak through them, take our hearts and set them on fire; for the sake of our Lord and Saviour Jesus Christ, Amen.